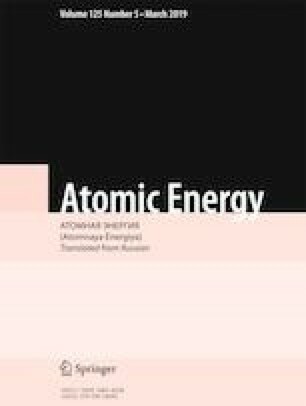 The method of gas transport of fission products from a target chamber positioned near the core of a research reactor to the measurement apparatus located outside the physical protection is studied. The aim was to optimize this method for the PIK high-flux reactor, which is in the start-up stage. The obtained parameters – efficiency of product collection from the target, rate of transport of the gas jet, optimal characteristics of a capillary system, and others – can be helpful for developing systems for real-time production of short-lived nuclides in high-flux reactors. Translated from Atomnaya Énergiya, Vol. 125, No. 6, pp. 338–343, December, 2018. O. Tarasov and D. Bazin, Exotic Beam Production with Fragment Separators, http://lise.nscl.msu.edu/lise.html. J. Ziegler, Interactions of Ions in Matter, www.srim.org.